Much like the ever-reliable pretty pastel trend, the need for neons each Spring/Summer season goes without saying. As the days get longer and brighter, we undeniably become more adventurous in our colour choices and so the release of a limited edition collection of irresistibly bright timepieces by London based watch brand Olivia Burton has been impeccably timed. At this time of year eye-catching accessories are just what we desire to fill our virtual shopping baskets with in order to begin creating our personal summer style for 2014. Launched only two years ago by London College of Fashion graduate duo, Lesa Bennett and Jemma Fennings, Olivia Burton has rapidly gained an impressive selection of both devoted customers and press coverage. Their collection of stockists is equally remarkable, including retail giants such as ASOS, Harvey Nichols, John Lewis and Topshop. 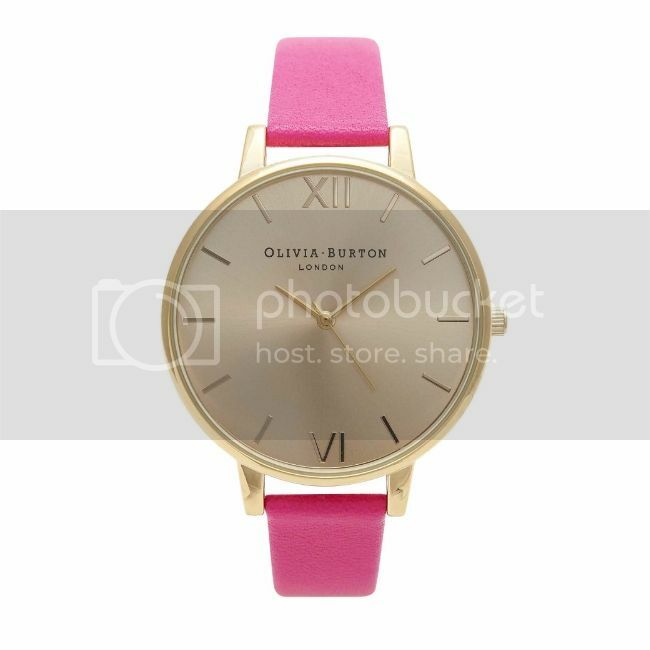 Loved for their affordable range of vintage inspired wristwatches, the latest Olivia Burton releases do not disappoint. “The neon collection was created to give a refreshing twist to the classic styles, and are perfect for the festival season,” explains company director, Jemma. 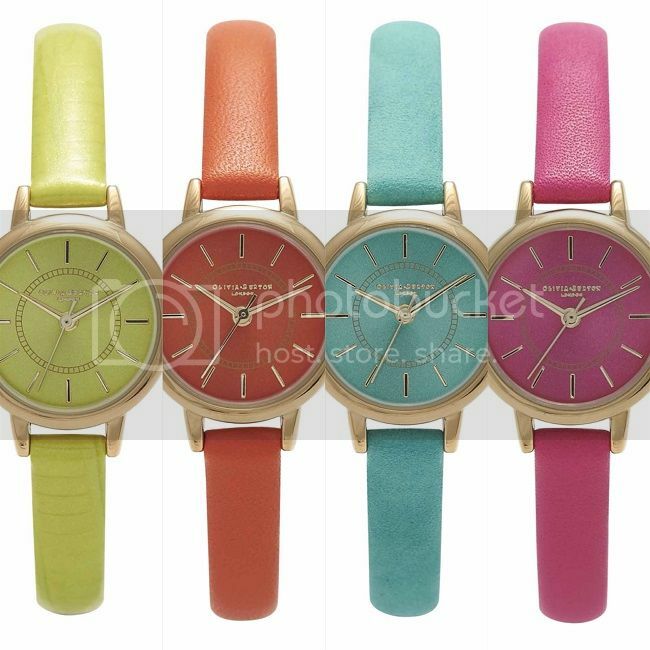 Four new ‘colour crush’ designs have been introduced, each with boldly coloured narrow leather straps and coordinating dainty 23mm faces. Choose from a striking selection of neon pink, glowing orange, bright teal, or luminous lime. If you prefer a larger timepiece, then the latest ‘big dial’ design in shocking pink measures 38mm across and will undoubtedly make an impression. Priced at £58 and £72 for the smaller and larger styles respectively, your favourite piece from this dazzling neon collection would make an ideal pay day treat. Neon was seen on the Spring/ Summer catwalks of Roksanda Ilincic, Preen, Peter Pilotto and Mark Fast, to name but a few. Both uplifting and exciting to wear, this vivid trend is one to embrace. Whether you feel brave enough to style yourself in top-to-toe brights as the warmer weather approaches, or if you would prefer to simply add small splashes of luminous colour to your ensemble, these Olivia Burton timepieces are a summertime essential. The pink colour crush style watches have already all been purchased, so be sure to determine which of the remaining neon styles is your favourite promptly, as once the collection sells out these bold beauties will be gone forever. Olivia Burton's timeless limited edition watches are available in store and online at ASOS, Harvey Nichols, John Lewis and Topshop. Watch this space... Neon is back as one of the hottest trends of the summer! Olivia Burton's limited edition watches are the ultimate summer wrist candy!